Praise houses – such as the one seen here on St. Helena Island – trace their roots to antebellum days when slaves built simple frame buildings on the plantations where they lived in order to gather for worship. The term “praise house” is thought to come from the phrase “prays house,” or a place where slaves could pray. Music, particularly singing, was an important element of praise house gatherings, and many services ended with a call-and-response round called a “shout.” The small structures – this one measuring just 10 feet by 15 feet – served as much more than just an informal sanctuary, however; people gathered in praise houses for community gatherings and meetings, where it often served as a sort of town hall or courthouse for the slave street and later for the freedmen’s communities. 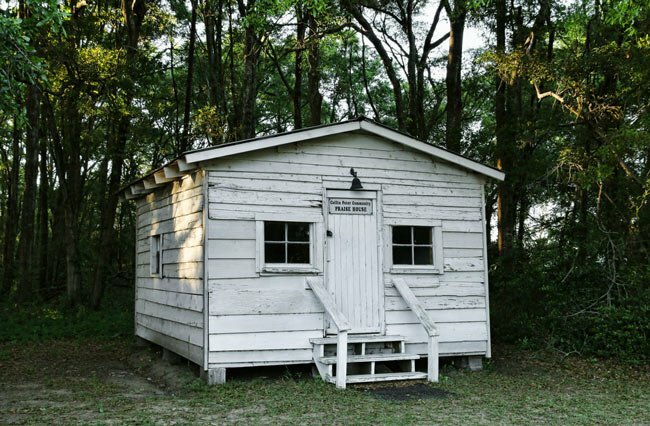 The small size of the praise houses is a tradition dating back to slavery when plantation owners feared that too many slaves gathering together could lead to insurrection. In fact, praise houses continued to be built after the Civil War, with several erected near the communities that formed after the collapse of nearby plantations following Emancipation. Many of these communities, such as Coffin Point on St. Helena Island, were named after the plantations that once occupied the land. Subsequently, the praise houses took the same names. Originally built around 1900 and rebuilt following a fire in the 1950s, the Coffin Point Community Praise House differs slightly in construction from other local praise houses in that it has two windows framing the entrance along with three steps leading to the front door. Most of the praise houses were even simpler than this one, with just one step at the entrance and no windows on the facade. Like its neighboring praise houses, Croft Plantation and Mary Jenkins, as well as Moving Star on Johns Island, Coffin Point Praise House is still periodically active. It is maintained by the Coffin Point Community Association.